MYAGDI, Sept 6: Annapurna Conservation Area Project (ACAP) has built new shelter house, widened walking trail and erected sign post on an alternative trekking route to Tilicho Lake from Mustang district. It takes just two days to reach Tilicho Lake from Jomsom using this alternative route. Officials of ACAP said that infrastructures like small bridges, tea houses and resting areas have been built to make the trail safer and more comfortable. Tulasi Prasad Dahal, chief of ACAP's Area Conservation Office, Jomsom, said that they upgraded the trail after witnessing surge in number of trekkers in recent years. “The 9.5-kilometer trail is now two meters wide. We are hopeful that it will now minimize mishaps,” he added. Trekkers can reach the lake, which is situated at an altitude of 4,919 meters above sea level, by crossing Mesokondo Pass (5,120 meters). Dahal also said that the office would add needful infrastructure to facilitate trekkers. 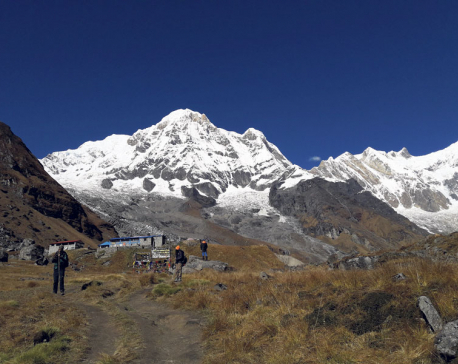 The number of trekkers had dwindled after snowstorm and avalanches claimed lives of around three dozen trekkers and trekking staff in the Annapurna Region in 2014. Following the disaster, tourism entrepreneurs were piling pressure on ACAP and the government to upgrade infrastructure along the trail. In recent years, there has been surge in trekker footfalls in different trekking routes of the Annapurna Region. 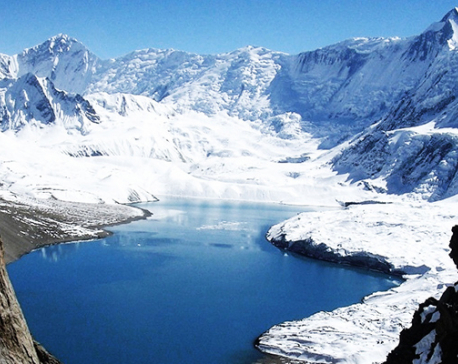 Tilicho Lake has also become a popular destination among domestic tourists. Khagendra Tulachan, president of Mustang Chamber of Commerce and Industry, says that the new trekking trail can be alternative to the Thorang La pass in the popular Annapurna Circuit trek. “We will now advise tourists visiting Jomsom to trek to Tilicho Lake as well,” added Tulachan.